Is Harry right about Sergio? Let's have that debate another day. How about tomorrow? We'll be back bright and early, at 10:00 GMT to be precise, with our build-up to Sunday's Premier League offering. While I head for the hills with a copy of the FA rulebook, here's the Match of the Day running order. In his news conference with the written press, Harry Redknapp has hailed Sergio Aguero as "the best player in the Premier League now Luis Suarez has gone." Manchester City goalkeeper Joe Hart on the disallowed goal: "I was aware that Charlie Austin was ready to pounce, so I was trying to watch Mangala, who I was trying to pass to. I was calm because I knew the rules. I had obviously touched it twice with both feet. It was a mistake and not something that is ideal but rules are rules. "I explained to Charlie at the end what had happened because obviously he was a bit confused." QPR visit Newcastle after the international break then host Leicester at the end of the month. What next for Manchester City then? After the international break, they host Swansea before welcoming Bayern Munich in the Champions League. Then they face a trip to Southampton at the end of the month. Tricky times. Muhammad Owais: City are in a bad place. Defenders are not performing well and they are out of confidence. But they will be back. Anthony Ismail: Southampton are keeping the season interesting! Ashley Williams: Van Gaal and Pellegrini are both struggling after massive spending. When does the pressure start? "Brilliant to see Hawkeye working at Anfield. Imagine if that had been working when Luis Garcia scored that famously controversial goal against Chelsea in the 2005 Champions League." QPR chairman Tony Fernandes: "Proud of our boys. Gave the champions a run for their money should have beaten Liverpool and gave Chelsea a scare. I'm a super proud chairman." An interesting stat for you... Only Les Ferdinand (13 in 1995-96) has bagged more goals in the opening 11 matches of a team's Premier League season than Sergio Aguero has managed this season (12). Here's more from QPR manager Harry Redknapp: "Before the game we'd have taken a point but when went 2-1 up felt three points were there for us. "We worked hard, pressed and closed and overall it was a great performance. We played well against Chelsea and it was an incredible game against Liverpool. We should have had another three or four points. "We were playing the champions and we should take a point but when you play as well as we have … they looked under the cosh at 1-0. "A second goal would have really put them in trouble, But that's why they are champions, they came back - and the little fella they've got up front is a genius." "If Southampton finish in the top four, that will be the single greatest achievement in Premier League history." QPR manager Harry Redknapp on Sky Sports: "I felt once we got 2-1 up we'd go on and win the game but they are always dangerous. "Charlie Austin, was it a goal, wasn't it a goal? We played ever so well. You can't relax against a team with so many quality players but I'm so proud of the players tonight. "The fourth official told me straight away that Joe Hart had two touches. I couldn't see what happened but if that's the rule there's nothing we could do about it. "Charlie Austin gets better every game. Playing with Bobby Zamora is excellent for him, his confidence is high." "Last year Brendan Rodgers overachieved with his Liverpool team. He had two strikers on top of their games, world-class players, Gerrard was brilliant last season but he has been worked out this. He was poor today. Liverpool overachieved, simple as. And Rodgers has overpaid for players like Louvren and Markovic." Abdulahi: Southampton don't need to beat any of the big clubs to finish in the top four. They just have to beat all the lesser teams. Abdul Kabir: Charlie Austin must be knocking on the England team door and getting the attention of Roy Hodgson? Are City too one-dimensional at the moment? Paul in Bushey: The league is a battle between Chelsea and Aguero. "Chelsea always seem to have another gear in reserve. It's like watching that Manchester United team of old. You know they will come at you, be relentless, will get a goal eventually and will go on to win the game." Manchester City manager Manuel Pellegrini: "Sergio Aguero is a fantastic player and he played very well. He scored two goals, he had two more chances, one cleared off the line, so it really was a great performance. He is a top player. He played very alone in attack. On Chelsea: "I am not worried about Chelsea. They are in a very good moment. We will see if they can continue that until the end of the year. We are just thinking about our team and returning to our style of play. "It was a very difficult week. We didn't have 72 hours to recover physically and mentally from another game but we tried until the last minute to win. We had clear chances but when the ball doesn't want to go in, it is difficult to score." Manchester City manager Manuel Pellegrini: "It was a good game for the fans. We are continuing to be very unlucky. "We had three or four clear chances to score and didn't. Then we were 1-0 down. "But this team are demonstrating that we are fighting. We are in an unlucky moment. We are not playing very well but we had enough chances to win this game. "It was the same against West Ham, where their goalkeeper was the best player. These 15 days (the forthcoming international break) will be useful to us to return to our normal style of play." Bobby Zamora says QPR should have had all three points this afternoon, he is disappointed. "In the last four games we should have had a hell of a lot more points but this is a big point for us. It would have been a great scalp, they have had a tough week." Edin Dzeko lasted less than four minutes after coming on as a substitute before he was replaced because of injury. Check out his touch map. "QPR/ManC, Liv/Che, Sou/Lei, Bur/Hull, ManU/CP, WHU/AV. @BBCOne later at 11pm due to remembrance festival #LestWeForget"
Jamie, Eastleigh: Looks like Southampton will be in second place for a few more weeks yet. It's all going well for Saints fans! Chris, West Sussex: This season's awards can be handed out already. Player of season: Sergio Aguero; Manager: Ronald Koeman; Best keeper, David De Gea; Title: Chelsea. Sam, Manchester: I'd take Matija Nastastic (remember him!?) in defence with Eliaquim Mangala at left-back right now, Gael Clichy is in shocking form at the moment. Also, congrats Jose Mourinho I guess. QPR striker Charlie Austin on the disallowed goal: "I had no idea it would be disallowed, you could see that from my celebration - I turned around and saw no one was with me. I just thought shoot. I thought it had put us 1-0 up but unfortunately not." Eight points behind Chelsea, four behind Southampton... Manchester City have it all to do. Alex Smith: Sergio Aguero is what Luis Suarez was for Liverpool last season. Manchester City's saviour. Kevin Unitt: Chelsea will walk the league despite spending only £9m net this summer. Less than half a Dejan Lovren. A third of an Eliaquim Mangala. "That would have been a magnificent goal from Yaya Toure to win it (see 90 mins), I think Joey Barton saved two points for his side with that block, it was a wonderful challenge. "Under the circumstances the result is a disappointment for Manchester City. You come here expecting to win, but there is no divine right and QPR could easily have come away with all three points. "Joe Hart is just now on the field showing his opposite number Robert Green how he managed to take that free-kick (see 17:38), and now he is explaining it to Charlie Austin. All controversy apart this was a magnificent advert for Premier League football. Every player gave 100%, on both sides." A nice moment as the players head from the field. Joe Hart and Charlie Austin discuss that goal which never was (17:38). I think they'll agree to disagree on the merits of it all. What did you make of that then? Without Sergio Aguero, Rangers would surely be celebrating three points now. Ball comes into the QPR box. Cleared. City attack again. Time for another Aguerooooo moment? Corner comes in and Rob Green easily catches Martin Demichelis's looping header. Sergio Aguero with another shot, this time outside the area, and again it's blocked. Corner. Four minutes left. Yaya Toure pulls the trigger in the area but Joey Barton slides across to block it. Alamo. Eduardo Vargas with a low cross, put behind for a corner by Eliaquim Mangala. The centre comes in and Charlie Austin flicks it wide. City are just pumping the ball forward now - and it's unsettling Rangers. Equally, QPR look a constant threat at the other end. One last twist? "Sergio Aguero is something else. His balance, precision and calmness are a delight." Sergio Aguero has nine goals in his last six Premier League games. Plenty of goal bonus in the Christmas pay packet. Panic stations! All of a sudden the QPR ship has been holed under the waterline, and they are listing to port. All over the shop. A routine punt downfield is left by Steven Caulker and Jesus Navas is on to it, he looks favourite but Rob Green just about gets there. Sadozaie: Where there is Kun Aguero there is hope! "Sergio Aguero pulls Manchester City out of trouble again. After some quick thinking and a flat delivery from Yaya Toure, Aguero had plenty to do, but he breaks QPR hearts with the finish. It's maybe not one for the purists, but for the punters this is a fantastic game of football. It has got everything." Sergio Aguero has dug City out of another hole. QPR must feel so deflated. Yaya Toure plays the ball into the little Argentine, who checks back and watches Richard Dunne slip to the floor before rifling into the back of the net with four defenders back on the line. QPR aren't there yet - James Milner having a header cleared off the line by Steven Caulker before seeing a shot deflected wide. The subsequent corner is cleared to Bacary Sagna on the edge of the box but his deflected, low shot goes wide. Mahesh: Can we have the Premier League crowning ceremony at the end of this game? Here it is Jose. Eduardo Vargas is digging about in his locker and pulling out all the tricks now - the Chilean is picked out on the edge of the area and his acrobatic shot goes just wide. "Bobby Zamora will claim QPR's second but I am going with Martin Demichelis, although I am sure he will happy for Zamora to have it too. Zamora attacks the ball, he was challenged by Demichelis and it has flown in past Joe Hart. "For the way Zamora has played since the first minute, he deserves that. Manchester City did well to get back into it, but if you are talking about overall supremacy in the game, QPR have had the edge and deserve the goal." Speaking of own goals, a master of the trade Richard Dunne clears off the line to deny his old club! Sergio Aguero nips around Rob Green, he has a tight angle but fires in the shot. Dunne races back, and facing his own goal pulls off a neat backheel to clip the ball away. When Charlie Austin isn't banging them in, he's setting them up. QPR win a 50-50 ball in midfield through Eduardo Vargas who spreads play out wide to Austin. A sensational cross comes in from the right and City defender Martin Demichelis, under pressure from Bobby Zamora, turns it past his own keeper. Jose must be laughing into his red wine. And Ronald, for that matter. Andy Carroll: Feels very good to be back on the pitch!! Thanks to all our medical staff for getting me back quicker than expected! first appearance of the season after an ankle injury, had two late headers saved after coming off the bench at Upton Park earlier today. Samir Nasri can go and join Edin Dzeko in the sponsors' lounge - he's replaced by James Milner for the final 15 minutes or so. Anthony: Hi Edin, bye Edin. Gary Wilkinson: That has to be down to a poor warm-up if Edin Dzeko is injured. QPR have some good players, they deserve something from this game. Joel Pambakian: Charlie Austin for England. Simple as. Yaya Toure accelerates down the left but is stopped in his tracks by another blood and thunder - but fair - tackle by Joey Barton. He's up for it tonight. "That has got to be the shortest appearance in history! Edin Dzeko must have taken a knock because he had only just come on. Ashley Ward knows how that feels but he was on the pitch a while longer than that. We don't forget do we?" In 1998, playing for Barnsley in a match at Sunderland, Ward scored, missed a penalty and got sent off in the space of five minutes. Edin Dzeko is coming off, just 60 seconds after coming on! He limps to the touchline and is replaced by Frank Lampard. Thanks for coming, Edin. Fred Eyre's beat me to it - Edin Dzeko is on for Manchester City, replacing Fernandinho. "It would have been a lucky goal in the end but well done to Eduardo Vargas for attempting the volley (see 63 mins), he caught it beautifully and that effort alone deserved a goal. 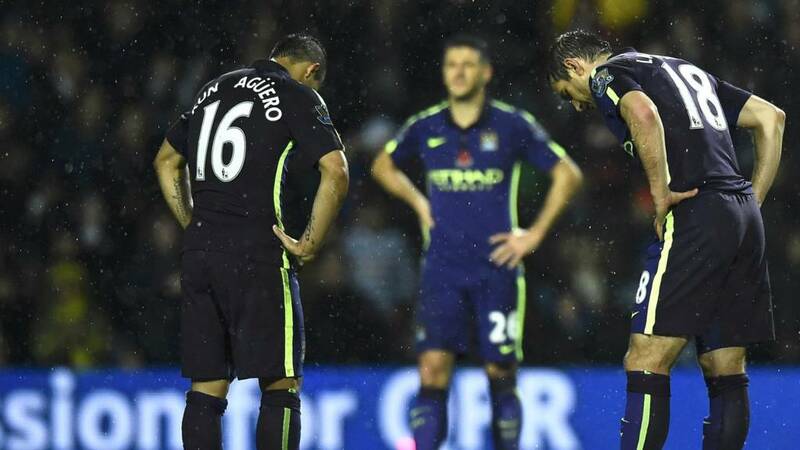 "A draw is no good for Manchester City in their position. You can see where the manager is coming from in bringing on Edin Dzeko for Fernandinho. Even though City have been on the receiving end of a pulsating performance from QPR so far, Manuel Pellegrini still feels his team should have the quality to win the game, quite rightly." The BBC Sport website is the only place to see the goals from the first round of the FA Cup. Follow this link to our FA Cup video section and enjoy at your leisure. Luke: Roy Hodgson is in the stands at Loftus Road. Can he take out Joe Hart or James Milner and put in Charlie Austin at this late stage? Ugo: Someone explain why Rickie Lambert (zero goals this season) is in the England squad and Charlie Austin (six goals) isn't. Rangers are on the front foot now - Richard Dunne* putting in a worldy of a cross with his left foot and picking out Eduardo Vargas on the edge of the box, whose volley hits Steven Caulker before going out of play. * Yes, it was actually Richard Dunne putting in a worldy of a cross. Absolutely superb defending from Fernando, who gets back to cut out Charlie Austin's cross before it meets its target and becomes a certain goal. As it stands, Manchester City are eight points behind Chelsea. They have 30 minutes left to change all of that. This game has been played in fifth gear from the very first minute and Manchester City continue to attack with purpose, while Rangers break in numbers the moment the champions lose their way. Another booking, this time for Bacary Sagna who loses out to Leory Fer then brings the marauding Rangers midfielder down. Tom and 20 others: Just found this in the FA rule book (appendix six, section 29): "Manchester City won't win anything this season if they carry on like this." Again City roll the ball along the QPR goal-line and fail to convert - this time Sergio Aguero failing to gamble on Yaya Toure's cross. It only needed a touch. Joey Barton gets himself involved by clattering into Fernandinho, who's still feeling his lower leg throb 60 seconds later. Reducer. "I fancy Manchester City to go on and win this now. I have seen games like this before, where teams down at the bottom of the table play way above themselves in the first half, before the team with the better players takes control in the second. "Sergio Aguero is constantly on the shoulder of the QPR back four and set up a golden opportunity for Yaya Toure (see 48 mins) in collusion with Samir Nasri." Now it's QPR's turn to go close - Leroy Fer's shot taking a wicked deflection off Martin Demichelis and going just wide. The subsequent corner kick is headed wide by Steven Caulker. It's end to end now - both teams looking positive after the break and Samir Nasri flashes a cross along the goal-line which Yaya Toure is inches away from turning in. Think Gazza against Germany in 1996. Quality defending from Mauricio Isla sees the Rangers defender deny Sergio Aguero in the area with a well-timed tackle. Michael, St Neots: All of the vitriol towards Mike Dean from the fans who don't know the rules themselves just shows what an impossible job refs have. They're trying to please people who don't know what they're talking about. Leave it to the professionals guys. Or at least get your facts straight before you get your knickers in a twist. Simon, Bath: So all these keyboard referees should be congratulating Mike Dean rather than slating him. And we're back under way at Loftus Road. There's been plenty of needle in this game, so Rangers boss Harry Redknapp has sent on Joey Barton to calm things down. He's on for the injured Sandro. "Where to start? We have had offside goals, a goal cancelled out by the referee because the goalkeeper took a free-kick incorrectly, a real wonder goal by Sergio Aguero, but tainted by a hint of handball, and a real fairy-tale story from Charlie Austin, coming up from non-league football on the south coast to be a constant menace in Manchester City's side. "We've had players flying into tackles, Richard Dunne making tackles like his life depended on it, we've seen Dunne at his best. It has been a scintillating first 45 minutes, and incredibly, more to come." Paul Cate: Let's give referee Mike Dean some credit. That was some incredibly quick thinking in a pressure situation. So, Charlie Austin could have had a hat-trick and Sergio Aguero might have handled the ball in scoring a goal from the top drawer. Throw in five yellow cards and it's been a manic 45 minutes for referee Mike Dean. A look through the rule book with a finer-toothed comb suggests that referee Mike Dean got the call right after all. • the kick is retaken." So QPR shouldn't have had a free-kick after Charlie Austin's second disallowed goal. As you were. It's been quite lively at Loftus, hasn't it? Now Mike Dean is dishing out yellows to Samir Nasri and Eduardo Vargas. Someone's bound to get sent off at this rate. Tom, London: Referee got the Joe Hart free-kick decision right (see 17:38). Law 13 says 'once ball is in play'. For free-kicks inside the penalty area, the ball is not in play until it leaves the penalty area. Peter, Isle of Man: The key is that the ball is not in play until it leaves the penalty area and so Joe Hart gets to take it again, that's the law. Rangers with a free-kick on the edge of the box, but Eduardo Vargas hits it straight into the City wall. Charles: Manchester City look awful. Full credit to QPR but City look disorganised and short on confidence. Chelsea may as well be given the Premier League title already - the only team in the league with any consistency or ability to dominate games. Charlie Austin v Joe Hart is turning into a right battle. This time the City stopper make a fine point-blank save from the Rangers striker, who was actually offside. Still, a decent save. Richard Dunne is the latest player into the book, this time for scything down Samir Nasri. Rangers need to keep their discipline here, because they have played well enough to suggest they can still get a decent result here. If they keep their full complement, that is. Sergio Aguero is causing lots of problems for Rangers now and he's brought down on the edge of the box by Mauricio Isla who is booked for his troubles. Yaya Toure blazes the subsequent free-kick over the bar. Andy Gillick: Sergio Aguero is unbelievable. Liz tray: Handball? Yes but accidental. No move of the arm. QPR goal offside anyway. Still, another poor performance. Can't pass anymore! Yaya Toure flashes another shot wide. Once he gets his radar right, Rangers could be in trouble. "We are struggling again without the benefit of a replay but it was a piece of magnificent control by Sergio Aguero, either with or without the use of a hand. The word from our studio is that it grazed the top of his arm. "City have been crushed but they are now at 1-1 because the team has one or two very special players. To bring that down out of the sky, juggle it, and put the finish away? World class." What a tremendous goal. Sergio Aguero has stepped up when it matters for his side - collecting a long ball forward from Eliaquim Mangala and showing Bergkamp-like control to brings the ball under his spell inside the box before lethally finishing past Rob Green. "Manchester City are missing David Silva today. In moments of crisis - and this has been 27 minutes of crisis so far- we look to them to put their foot on the ball, to control the game in difficult moments and to give the team a lift. That is what makes those players extra special." Manchester City finally show some attacking purpose as Yaya Toure bends an effort just over the bar. Close, but no cigar. Rich: Why was Joe Hart allowed to re-take the goal kick, when it was his mistake? Surely QPR should be awarded an indirect free-kick? Adam Knott: Mike Dean doesn't know the laws of the game. Double touch = indirect free kick to the other team. Law 13 (see 17:55). It appears that QPR should have been awarded a free-kick inside the penalty area when Joe Hart fluffed his free-kick. an indirect free kick is awarded to the opposing team, to be taken from the place where the infringement occurred." Read more on the rule here. "City are getting a tatering"
"No team can withstand the kind of pressure Manchester City have been put under without conceding eventually. Charlie Austin has finally got his reward and has put QPR in front. They've have got their tails up and quite rightly so. But there is a massive gap between Gael Clichy and Eliaquim Mangala. That is where all three of Austin's chances have come from. City are getting a tatering here." Charlie Austin doesn't miss, does he? It just depends on whether the goal is allowed to stand, and it's third time lucky for the Rangers hitman who collects a incisive ball from Eduardo Vargas and drills the ball past Joe Hart. The striker was played on by Eliaquim Mangala. Manchester City have been dreadful. In fact, they've been worse than that. Quality stuff from Rangers, though. AndyK: Joe Hart has been let off the hook again by the ref, shades of that awful "obstruction" decision at St. James's last season. Any hopes Mike Dean had of a quiet Saturday evening have been dashed in 15 manic minutes at Loftus Road - this time the referee turning down strong appeals from the hosts when a shot appears to strike Bacary Sagna on the hand. It's all going off. Mahesh: What a rubbish rule! Whose fault is it that Joe Hart took two touches! Play advantage! Adrian Remedios: Two goals back-to-back denied by the referee! QPR are giving City a run for their money! Good going! Those two disallowed goals have had the equivalent effect of a shot of whisky in the home crowd. It's served as a real livener as they scream for every decision. And they almost see their side go ahead for a third time when Joe Hart saves Charlie Austin's eight-yard shot. "Bizarre goings on at Loftus Road. Charlie Austin has two goals disallowed in seconds. The second for an incident I don't think I've ever seen before." "QPR fans are very fired up after that double disappointment for them. It was a huge error by Joe Hart and he is very fortunate not to have been punished for it. It would appear he was going to play it out, changed his mind but couldn't change his body quick enough." Joe Hart... you lucky, lucky boy. The goalkeeper makes a complete hash of a free-kick - seconds after seeing one goal disallowed - and Charlie Austin picks up the ball unmarked and drills home. However, the referee Mike Dean rules Hart kicked the ball twice from the free-kick - hitting it first with his left foot via a slip, and the goal is chalked off. Technically right, but Hart is so, so lucky. He should put the lottery on tonight. "It's been a lively start from Manchester City. The two full-backs have pushed right up already, up to a starting position near the halfway line, and in central defence Martin Demichelis and Eliaquim Mangala have split and spread out. That will suit Mangala, but Demichelis doesn't have loads of pace at his age. "Richard Dunne, the former City stalwart, he loves putting blocks in, putting his body on the line. I think he will be instrumental in how QPR fare today." Manchester United manager Louis van Gaal, speaking to BBC Sport: "It was a fantastic goal but it was important also. It is always difficult to attack against a defending team, who comes here to defend and not attack. You have two rows of four and we created a lot of possibilities. I am pleased because we have three points and there is an international break so it was important we closed with a victory. "Juan Mata has played a lot of matches. I have given him the chance, I give other players the chance and at the end we shall see who plays more than the other. It is always like that in football. "They [McNair and Blind in defence] didn't have to defend too much because we always had the ball. They only had to defend the long balls but that is difficult because Chamakh and Campbell are strong headers of the ball. "Paddy McNair is not injured. It was cramp. It is [recent injury problems] crazy but it is what I have to deal with." Sergio Aguero is lively early on - driving forward and leaving four defenders for dead before blazing over when he might have been better placed playing in Jesus Navas down the right. Liverpool striker Daniel Sturridge: Shame about the result today. Deserved something from the game. Looking forward to resuming full training next week. Manchester City serve an early warning of their intentions when Sergio Aguero breaks through and bears down on goal but he takes too much time to pick out the run of Samir Nasri and his subsequent pullback is cut out. Moe Muntz: We're due a downpour of goals to make up for the boring last two hours. Manchester City are in their purple kit tonight, with QPR in their usual blue and white hoops. Both sets of fans are in good voice under the bright Loftus Road lights. A minute's silence ahead of Remembrance Sunday is impeccably observed. A loud cheer follows, then the referee blows his whistle. Game on. "It's more than pouring this - it's like a tropical storm! The pitch is in perfect condition though - there are no puddles or anything, and if the rain ceased now it would only have that little bit of skid on the pitch. A night game, in London, it would be a fantastic atmosphere. But it needs to stop raining first - this is bad! "To keep in touch with the two at the top Manchester City have to get three points here. A draw will not do. Eliaqium Mangala has had a really difficult start to his career in the Premier League, hopefully this will be the chance for him to turn a corner." Fancy watching some FA Cup action? We've got highlights coming from all of today's 25 ties, with the first ones already available to watch. Crystal Palace manager Neil Warnock, speaking to BBC Sport: "We are having that kind of spell at the minute, nothing going right for us. If Fraizer Campbell had scored that chance he had it would have put a lot of pressure on them, but it was not to be. I thought the referee did well today, I am just disappointed to concede the goal. I think Julian Speroni will have been disappointed. "It is hard at times for a lot of clubs at this level but you just have to keep going. I can't criticise the lads today. The passing was poor at times, though, we made some bad decisions with the ball. "You have to work hard to make your own luck. Liverpool next, after last year that should be a cracking match and I am looking forward to it." It's proper rain at Loftus Road now - the type that soaks you through! None of that spitting stuff. Puddles are forming beside the pitch and in the stands. Hopefully the ground can cope with this downpour which started at 16:30 GMT. Samir Nasri is back in the Manchester City side from the start this evening - can he fill the golden boots of David Silva? Manchester United's Juan Mata, who scored his side's winner: "I was thinking if I come on I would try to change the game and luckily I did it. "The manager told me I was playing on the right, I tried to make the pitch wide and come inside as well. That is what I did. The most important thing is that we won and the three points will help us to carry on this good run. "Right now I am very happy with the goal. I have three at this moment of the season. I always try to help the team. Hopefully now in the international break we can recover our injuries." Richard Taylor: Sir Alex Ferguson used to grind out 1-0 wins too. Back then people said it was the sign of champions! Simon Foley: Saints making the most of a very kind fixture list. Six of their eight wins are against bottom half teams. Best scalp to date? West Ham. QPR boss Harry Redknapp: "We've had a tough run of games but we've played well against Chelsea and Liverpool. We deserved more points and now we are against the champions. "We need to be at our best. City have so many quality players - look at the bench. They're fantastic. But we are at home, this is our ground and we look forward to giving them a real game." I can tell you it's absolutely tipping it down in west London. Expect a sodden surface for this one. There's a few faces in the crowd wishing they'd remembered their waterproof coat. Lisa: Don't want to be a killjoy as I'm also enjoying Southampton's run but they haven't played any of the big boys yet. Lack of squad depth will probably kill them in the end. Though would love to see them finish above Liverpool after selling three to them. "Diego Costa and Sergio Aguero are South Americans and Arsene Wenger flagged this up last week. They're so tough and resilient. "But Manchester City should be inspired by playing in the Champions League because it's the best club competition in the world. I look at that side sometimes and see the bigger players not turning up in the Champions League. Analyse the way they play then look at the manager - is he getting his teams up for it?" "Sergio Aguero is a Premier League great. He scores so many big goals, and his movement marks him out. When he's not playing City miss him so much for that very reason. "But Manchester City didn't buy any marquee signings pre-season. They needed to improve as champions, but they didn't." Harvey: The result was the most important thing for Manchester United today, but need to improve. Also, Angel Di Maria's crossing was terrible! £59.7m has got to beat the first man more often! Simon, Berkshire: Everyone should forget Crystal Palace's achievements last season. Make no mistake, we are in a relegation scrap. Dan Vitran, Leicester: Disgusted at the Nigel Pearson out comment (see 16:46). He has won us two trophies in the last four years and two play-offs. He deserves a full crack at the season. He has earned it and we have had close defeats in all our losses this season. He has a great philosophy, lots of young players and British talent. I have complete faith we will turn it around after the international break. We haven't had quite the upset today as we did last night with Warrington, but I'd like to be out in Dover and Chester tonight, after the Conference sides both knocked out league opposition in the shape of Morecambe and Southend respectively. The other upsets from today came in the form of Cheltenham Town, who thrashed West Country rivals Swindon 5-0, and Cambridge's defeat of Fleetwood. The fairytale ends, though, for East Thurrock United, Hemel Hempstead, Barnet and AFC Fylde, after the non-leaguers all lost to league sides. You can keep up with all of the reaction from up and down the country here. Tonight's game sees two in-form strikers go head to head. Manchester City's Sergio Aguero has scored 11 goals in his last 12 Premier League games, while Rangers hitman Charlie Austin has been involved in six of QPR's nine goals so far this season (five goals, 1 assist). Raffiyell: Saints' winning run is just incredible! Jonny Walker: Luke Shaw looked really good going forward and very solid defensively. Who says he's not worth £30m? "We know the fans want more"
"Of course we understand the people who have been criticising us. The club invests in top players and the fans want to see more from us. "But we still have time to put things right. The supporters here are more respectful and patient but they still expect a bit more from all of us. We can still turn it around, though. "In the Champions League, we are not currently in the position we want to be. It's not what we were expecting. The only thing we can do is to keep going, we still have two games to play and we have to win both, and then wait and see how the other results go. "In spite of how badly things have gone in the Champions League, we are still fortunate enough to be able to qualify. So it's up to us." Manchester City manager Manuel Pellegrini: "We have to react with balance and with personality. We must carry on as we have been playing in the Premier league. "We needed a fresh team, physically and mentally. I spoke to the doctors and my technical staff and this is the best team." Stuart Pearce will be breathing a mighty sigh of relief as his Nottingham Forest team get their first win in 11 games thanks to a late winner from Michail Antonio. Britt Assombalonga had earlier got Forest back into the game after they fell behind to Norwich early on. Middlesbrough against Bournemouth ended up being an anti-climax, their 0-0 draw means Derby stay top of the league after their earlier win. Ipswich were also big winners, their 1-0 win over Watford courtesy of a late Tommy Smith goal moves them fourth and Danny Shittu had a remarkable day - scoring twice and adding an own goal as his Millwall side lost to Brentford. Fulham edged out Huddersfield 3-1 at Craven Cottage with Ross McCormack hitting a stunning late goal, while Leeds scored three first-half goals to get the job done against Blackpool, it finished 3-1. "It's absurd that Manuel Pellegrini won the title last season and three months into the new campaign people have been talking about him getting the sack. City have not been on a great run of form, and there is all this talk of underperforming in the Champions League, but how many years did it take Chelsea to win the Champions League? How many years did it take Manchester United? It takes time." "I don't see Manuel Pellegrini having huge authority in that dressing room. I don't see him demanding the very high standards like Sir Alex Ferguson did, or Jose Mourinho does. He reminds me of Sven Goran-Ericsson. Does he really have that ultimate drive and desire to push people on? "You almost get the feeling that the players have more influence." So, it's fair to say Manuel Pellegrini has had better weeks. It started off well enough, with victory over Manchester United last weekend, but defeat to CSKA Moscow on Bonfire Night has all but burnt their hopes of qualification to the next round of the Champions League. International break? Not for the physios at Carrington. Paddy McNair picked up an injury at the back for Manchester United this afternoon, leaving the defence in relative tatters. The injured men will be wrapped up in cotton wool for the next 10 days or so. Right, plenty of reaction to the 3pm goal-fests to come, but now let's turn our attention to the late kick-off in the Premier League. Cesar Azpilicueta: Massive win! #team #MOTMMatic #goalscorerCosta #goalscorerCahill. win at Liverpool earlier today. Steve Huish, Surbiton: The days of Manchester United comfortably beating teams at Old Trafford are well and truly over. Shows how good Sir Alex Ferguson was, making average team players feel special and winning. "It was against QPR that Sergio Aguero scored his stoppage-time, title-winning goal a couple of years ago which will always bring a smile to City fans' faces, but this trip to Loftus Road looks trickier than it would have done only a month or so ago. "Recent results have been patchy, with one win from the last five in all competitions, and Wednesday's performance in the Champions League in losing at home to CSKA Moscow was way below what's expected." "A lot has been made of Burnley not winning a game this season, but that has all changed now. Ashley Barnes was the goalscorer and it was a much deserved victory for the Clarets." Graeme, soaking wet, in Wetherby: Pretty boring afternoon in the Premier league. Hopefully the goals, like the rain, will be non-stop in the QPR v Man City game. "Manchester United did just enough to win. Fraizer Campbell had a great chance to put Crystal Palace ahead in the first half, he just had to dink it over David De Gea's head but he lifted it over the net. Juan Mata came on with a point to prove, he scored but Julian Speroni will be disappointed because he should have saved Mata's shot, although it did take a deflection. United did not create many chances again but they have the three points." Vinny Person: Southampton are blowing most of the Premier League away in style and on an incredibly low net spend. Admirable. Edward Layland: Wonder of Morgan Schneiderlin still wants to go to Spurs? Jay Rodriguez might. Sushant Shetty: Van Persie may have given United a title but has hurt us long term. Rooney upfront with Herrera is so much better. There were 10 bookings dished out by Mark Clattenburg at Turf Moor today - six for Burnley and four for Hill. Aston Villa goalkeeper Brad Guzan applauds the travelling support, he had a storming afternoon between the sticks to repel wave upon wave of West Ham attacks. Burnley's first win of the season is in the bag. Let the Claret flow. Andy Carroll has another big header well saved - he's causing havoc! "The better team won the match on the day, but Palace had their big chance and Campbell fluffed it just on half-time. Not a lot made it's way through the Palace defence, and apart from the one goal United weren't very convincing." Andy Carroll! That's what he can do! Brilliant header, flying header, but Brad Guzan paws it away. Almost an instant hero on his return. "Palace have a lot of energy and cover each other by working really hard, but really all they've done is provide a defensive barrier in front of Speroni. The goal, when it came, was a long shot. Contrast that with the chances Palace have had, which have been very limited. "The fans are making their way to the exit, which sums up the United performance. Not very convincing." We're into injury time now, folks. One last goal? Charles, Cranbrook: Saints have real strength in depth. Jay Rodriguez (remember him?) has a fight on his hands when he returns. Leicester with a chance to pull one back but Chris Wood, who breaks through on goal, chips his effort over the goalkeeper and wide. Might as well pack up and go home now, lads. OletuM M R: I don't understand Van Gaal's philosophy yet to be honest. Utter rubbish. Edward Layland: Inspired work from Ronald Koeman. Loving our manager! David McCallum: Nigel Pearson out! Who'd be a manager, eh? What a chance! West Ham nearly steal it as the cross finds its way right through a crowded box to Carl Jenkinson. The on-loan Arsenal full-back gets his neck into the ball, powerful header, but straight at Brad Guzan. That was a golden chance! "Defensively, Palace have been pretty good. But once United got the goal I've wondered whether Palace have the wherewithal to create their own opportunities. Ever since falling behind they have been on the back foot, really." Aston Villa defender Nathan Baker has a serious-looking injury as he challenges Carlton Cole and does something to his ankle. Or possibly knee. I'm not a doctor. He needs a stretcher anyway and Philippe Senderos is on. Senderos for the final five - panic stations? Brentford have battled back against Millwall to re-take the lead at the Den. Andre Gray has turned provider this time - his cross diverted into the net by Millwall's Danny Shittu for an own goal. 3-2 to the Bees. Huddersfield equalised through Joel Lynch at Craven Cottage but their joy was short-lived. Fulham go straight up the other end and score through Lasse Vigen Christensen. It is still 0-0 in the game at the top of the table between Middlesbrough and Bournemouth. The Cherries were the league's top scorers going into this one, but they have come up against the league's sternest defence at the Riverside. Derby will stay top of the league if it finishes this way. Hull are starting to turn the screw now and a cross is stood up to the back post where Burnley defender Michael Duff gets his go-go-gadget neck out to head clear. United have had 71% of possession so far actually Jimmy. Still not been a good showing though, as James Wilson shows what he's got in his game, namely fierce pace. Strong run down the middle before he eventually loses out. "Shane Long hasn't come straight into this Southampton side since joining from Hull because of the form of Graziano Pelle and Dusan Tadic, but he has been patient and that is what you get for £12m. Two chances and two goals." "And now you're going to believe us... we're going to win the league," sing the Southampton supporters. Imagine that. "Manchester United have given their fans plenty of frustration today. Old Trafford has been quiet, edgy, sensing that at any one time Crystal Palace could fashion something. Think about it - United must have had something like 75% of the possession but no real end product." He's the only man who has brought his shooting boots today! Juan Mata skims a shot against the post, lovely strike, takes a slight nick off a yellow shirt on its way through the air but Julian Speroni had no chance. Very unlucky, the Spanish number eight.